​​​​​​​Designer Kirsty Davis adjusted the initial plan for this master ensuite, taking out the bath and acquiring space from the large adjacent garage. As a result, the bathroom is in better proportion to the scale of the suite, with enough room for a generous double shower and a long his and hers vanity. 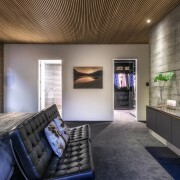 For many people, concrete is too hard and harsh a material to be used prominently in an interior. 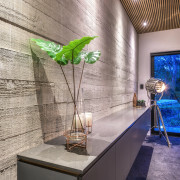 But it is possible for a home to feature the positive qualities of concrete and yet still create a warm ambience – as seen in this master suite by designer Kirsty Davis. Davis says the suite is at the rear of a modern home with a concrete tilt-slab construction and extensive glazing. She was called on early in the planning stages to design the kitchen and bathrooms and select materials and furnishings. “The initial plan had a closet and an ensuite that were quite small and out of proportion with the bedroom,” she says. 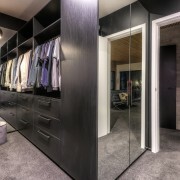 By crimping space from the large adjacent garage, and moving the planned bath tub to the home’s main bathroom, she was able to increase the size of the closet and have enough room for a long vanity and generous double shower in the bathroom. Davis felt it was important to have a continuity of materials throughout all the different areas of the home – including the use of concrete. 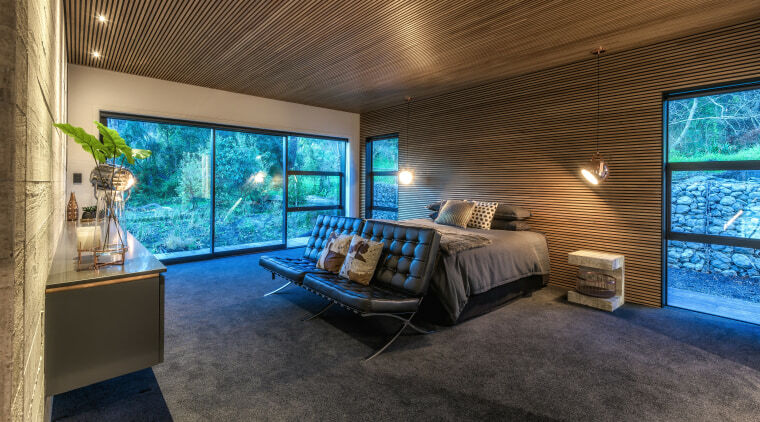 So the board-formed concrete wall that forms the spine of the home wraps around into the bedroom and is left exposed. 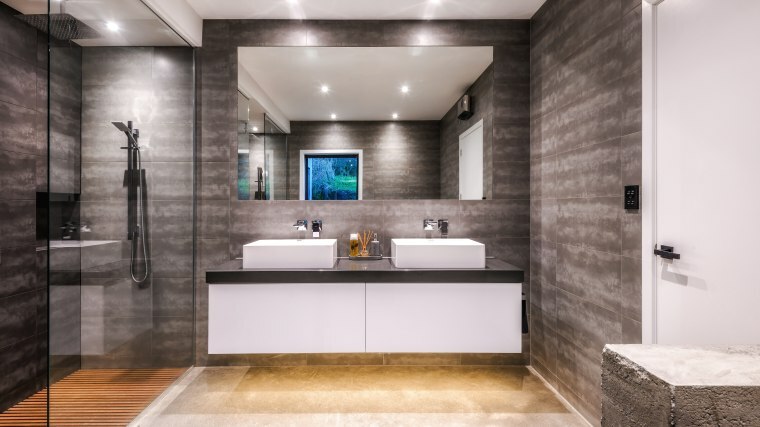 ​​​​​​​A low raw concrete nib wall provides some privacy for the toilet area behind the door in this master ensuite. 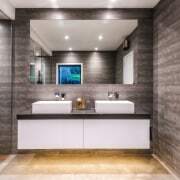 The 80mm-thick mitred Caesarstone vanity top is consistent with the kitchen benchtop and vanity tops in the other bathrooms in the house – all designed by Kirsty Davis. A sliding glass door opens to a native planted area, while the rest of the room is all white, with little remaining wall space. 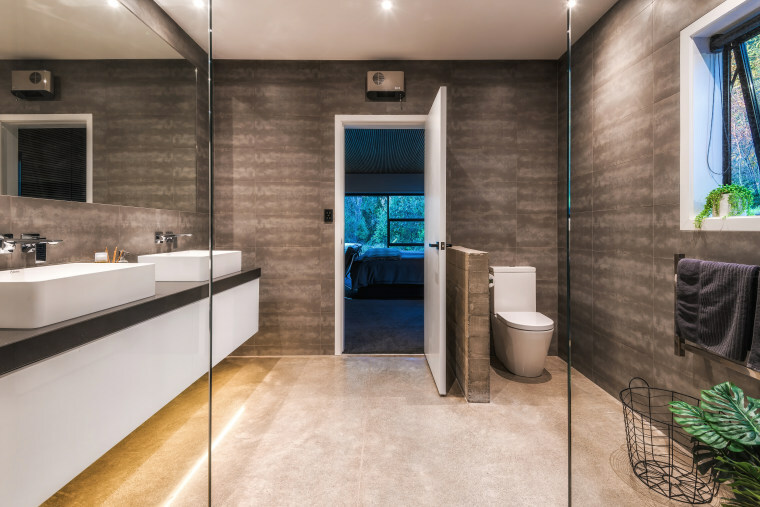 In the ensuite, the use of concrete continues with a heated, polished concrete floor and low privacy wall beside the toilet. Lightly patterned tiles extend the grey theme, with those on the back wall of the shower being a slightly dark shade than on the other walls. Here, the hard materials are again softened with timber slats – this time forming the shower base.